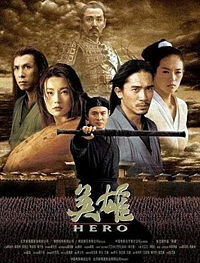 A pseudo-historical story which I have heard countless times before, retold with an all-star cast and with the help of Christopher Doyle’s cinematography, Hero is a treat of a film. Shown recently at the Melbourne International Film Festival, its single screening sold out quite quickly. In fact, a group of five friends of mine who went to buy tickets managed only to get the final three for the session. We soon found out why. Based in China during the warring states period, the story revolves around a nameless assassin played by Jet Li. The king of the province of Qin, who would eventually go on to conquer all of China, has summoned “nameless” to his court in order to reward him for vanquishing three legendary assassins who were bent on assassinating him. The basis for the movie is the retelling of the story of how this impossible task was accomplished. Given the calibre of the production crew and the cast, there was never really any doubt that this movie would be a success of some sort. What I was expecting, was a big-budget martial arts film which would sell itself on the basis of its stellar cast and crew. Indeed, the website for the movie bills it as “The first martial art epic from Zhang Yi Mou”. Interestingly, it was the martial arts scenes in this movie which let me down a bit – but that was where the letting down stops. The film is very character driven. This is a good thing, especially in a world where all too many martial arts films seem to be made up of stories and characters whose sole purpose in life is to generate situations for fights scenes. The characters have good depth; this is further complimented by the nature of the storytelling which I also found to be very well done. At first the story seems quite clever, but essentially clear cut and simple. However, the character of the King is revealed when he, himself, retells a part of the story which is apparently at odds with the original story. Various versions of the story then make themselves known, each with the characters wearing different colours to help you keep track. This device is used to brilliant effect and complements the already stunning cinematography of Christopher Doyle. Themes of love, honour, loyalty and duty run through this film and through clever storytelling and good characterisation are revealed to be having something of a tug-of-war. This is one of the strengths of the film, that it keeps you on the edge of your seat right until the very end, to see which ideas win this tug-of-war. A surprise of a film, but a welcome one. The king of Qin, who is usually depicted as a simple and ruthless tyrant, is given new dimension and complexity which really helps to bring the film together. The cinematography is simply gorgeous, it would not be inconceivable to see this film for that reason alone. There are echoes of “Crouching Tiger, Hidden Dragon” in this film (not least because Zhang Ziyi is in both films) but this is a different film, and is of a very high quality in its own right.